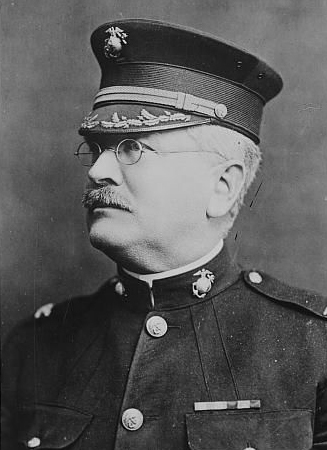 Major General Joseph Henry Pendleton (1860–1942) was a United States Marine Corps general for whom Marine Corps Base Camp Pendleton is named. Pendleton served in the Marine Corps for over 40 years. On December 15, 1914, the Second Battalion of the Fourth Regiment, U.S. Marines, set up a tent city and parade ground adjoining the rose garden at the exposition’s south end. At the invitation of exposition president G. Aubrey Davidson, Colonel Joseph H. Pendleton, commander of the U.S. Marine Corps, Fourth Regiment, established his headquarters on the balcony floor of the Exposition’s Science and Education Building. And, finally, where could there be a more fitting place for an exhibi­tion camp of United States Marines? San Diego’s every advantage of climate, of strategic location, of wonderful natural formation of land and sea, make it the perfect, the ideal location for a Marine Corps Advance Base Station. When our visitors see the training of the Marines, their varied instruction in the different trades of warfare required in Advance Base and Expeditionary work; when they see the benefit of this thorough training in the almost instantaneous movement of these men when called upon, as they have been twice, since the opening of the Exposition, for a sudden dash to the scene of threatened trouble; they appreciate what pre­paredness means, and what it should mean in a much larger way. They can appreciate why San Diego should have a permanent Marine Advance Base Station, of a Brigade at least, in this most advantageous location, in this most strategically, and climatically, perfect situation. …from Wikipedia and the books Balboa Park and the 1915 Exposition by Richard Amero and Army and Navy Review 1915 Panama-California Exposition.